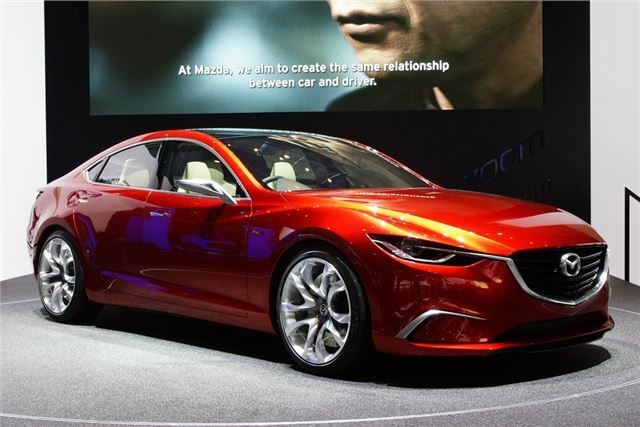 Mazda has revealed its Takeri concept car - which will eventually become the next Mazda6 - at the Geneva Motor Show. The four-door saloon uses Mazda's fuel-saving Skyactiv technology, including an engine start/stop system, to reduce emissions and improve fuel economy. The new 6 is due to be launched at the beginning of 2013 with prices expected to start at around £18,500. The brand is promising the new 6 will be fun to drive with good performance and sharp handling. The Takeri concept car is the first Mazda to come with a new i-Eloop system (that stands for Intelligent Energy Loop). This is regenerative braking system that converts kinetic energy into electricity when braking and slowing down. This power is then used to run electric components on the car, helping to reduce fuel consumption. The Takeri will also use new Skyactiv Diesel engines and features a new six-speed automatic gearbox. Mazda also showed the new CX-5 crossover at the Geneva show along with a new special edition MX-5 called the Venture Edition.